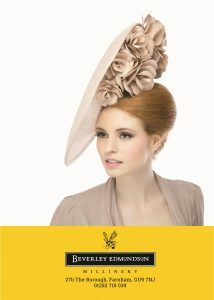 At Beverley Edmondson Millinery, our mission is to make you look and feel fantastic for the big occasions in your life. In the market town of Farnham, Beverley Edmondson Millinery can be found on the bustling high street amongst an array of independent retailers. Beverley Edmondson Millinery has now been established for 9 years, with our Farnham boutique opening in spring 2010. Having trained with some of the world’s best milliners, Beverley has made hats for film, television and a certain royal wedding. Our boutique has been nominated for several awards including Niche Fashion Retailer of the Year by Drapers in both 2015 and 2016 and highly commended accessory designer at the Wedding Industry Awards. Beverley Edmondson Millinery’s designs regularly feature in national and international fashion pages and blogs. Beverley is one of the founding members of Farnham’s retailer group, Fabulous Farnham. Fabulous Farnham promotes Farnham’s high street, retailers and community. Beverley also works both locally and as part of national future highstreets projects. As a natural development Beverley offers business coaching and mentoring for creative and independent retail businesses to adapt for the changing landscape of the high street retail environment and to support milliners hoping to launch their own atelier or label. As well as a successful milliner Beverley is also a Creative business coach. Understanding the balance between creativity and running a successful business is something that Beverley feels passionately about. Beverley noticed a lack of help and advice on setting up in business from people who really understood the concept of making your own products by hand and turning it into a profitable business, from there Create and Conquer creative business mentoring was born. Beverley also offers The Power Hour. Beverley says: “Our one hour reclaim your perspective sessions are perfect for when you are feeling overwhelmed or like you’ve lost direction in your creative or retail business. Your business is your baby, it has the biggest ups but also the biggest downs. I am here to support you when you are feeling down and help propel you back to the stars where you belong. Think of me as your business fairy godmother.” Each power hour is taken via video skype.